- Image from Help The Aged UK, now merged with Age UK. The unexpected letter from Dolores' solicitor, Damian Brass on January 4, (concerning an Enduring Power of Attorney) was seen by Saoirse as an opportunity to bring to his attention Dolores' situation and seek his help in aiding Dolores. Although she could see no relevance of the EPA to Dolores' current situation, she now hoped that both the Elder Abuse Senior Case Worker Geoffrey Blair and Damian Brass might even join forces to help her mother. Does anyone have documentation of Ethan's ramblings, threats etc. especially during 2005/2006 when he's to have bullied Dad into a down-payment for the Finglas house? Or anything related to that? Any evidence of forging Dad's/Mom's signature or bullying/physically attacking both of them? Alex and Conor both you were threatened in your places of work. Do either of you have any copies of those threats to your employers? Can you please send me copies via email or post? I ask because I'm trying to collect all the paperwork and proof I can. I'm expecting to check out deeds etc. the week after next and will update on that. Can any of you email or post what you have. It'll all reveal Ethan's pattern/ways of doing things etc. Please. Please. The evidence/truth will speak for all of us! It appears that even with three new phones (which Sophie has said mom now has but which I believe none of us have numbers for) Ethan is not allowing access as he was supposed to. Naturally, the assurance from Sophie that mom and she would ensure Ethan was seen by a professional if things continued is off the table. “I sent mine [email received at work from Ethan] straight to my solicitor. I am now back in contact with his firm so will ask if he has copies. Nathaniel had the phone message downloaded onto a cd as far as I can recall. Dad rang him in bits becuase of what Ethan was doing. [Editor's note: According to Sophie, Ethan provided Dolores with three new mobile phones about this time. If true, we can only speculate that the reason was to further isolate Dolores. The “phone message” Conor refers to is a conversation Cecil had with his eldest child Nathaniel concerning the duress he and Dolores were experiencing from Ethan concerning the purchase of Ethan's house in Finglas, Dublin. The agreement was that Dolores and Cecil would purchase a house (from the proceeds of the sale of the family home) for Ethan to live in and rent from them, in exchange for Ethan's promise to leave them alone. What occurred at the last minute of this transaction was that the house was purchased outright by Dolores and Cecil and the deed assigned to Ethan. It was a very distraught father who called his eldest son pleading for help, to protect himself and his elderly wife from their youngest son's abuse and bullying. In a conversation with Nathaniel, Langdon Jaggers advised that this transfer was none of Nathaniel's business, and the violent abuse towards Dolores and Cecil, was none of his business. Ethan of course did not leave them in peace afterwards. A Brief History of Jaggers and Brass. We believe the audio of this very upsetting conversation would have proven a help in garnering the attention of HSE Elder Abuse from early on, and would be extremely helpful today in accelerating the slowly revolving wheels of justice. It has been sought numerous times; it has not been forthcoming. Conor, Sophie had some concerns way back around that time and provided documentation to someone. Was that your solicitor? I understand she was trying to stop the whole thing and then backtracked but that there was paperwork somewhere. sophie put in paperwork wiht dolors's solicitors when [the family house in Dublin] was being sold. we need to remind them of what happened on that sale and that we are more concerned about dolors [Dolores] welfare not being allowed to speak to her or see her. all ethan's doing of course. [Solicitor's name] is the lawyer I went to see about Ethan's attempted extortion on me. Sh** Conor. I had no idea re: extortion!! For god's sake. This is a nightmare. I can only imagine what Mom's experiencing based on that. Good on you for heading to [solicitor's name]. Is he the same solicitor Sophie went to or is it the Jaggers and Brass crowd? Who's the solicitor there in Jaggers and Brass? I wrote back to Damian Brass, who sent the letter re: power of attorney but he declined to say who mom's solicitor was other than he was planning on meeting with her and had sent her a letter last week. I heard back from him Thursday and haven't yet had a chance to respond to him. I'd be happy to also remind [your solicitor] of the problems around the sale of [the family home] but the little I know is what I heard and what I encountered when at home helping them pack up. However, if you need me to give him anything from what I've been experiencing around Ethan as of late, am happy to do so. Just let me know. He's on [street name] in Dun Laoghaire right? I couldn't have written any of this. It sounds so wild and off the wall but the pieces all fit together and it gets clearer and clearer. I am going to put a draft together to the solicitors. Sophie had corresponded with them [Jaggers and Brass ] on thsi. I want to use this letter against them. ie put the onus on them to protect dolors. if ethan is going to try and bully dolors [Dolores] like this then we will play hardball with him to protect here. We owe her a responisibiltiy to portect her. . If Sophie put paperwork in with Jaggers and Brass does anyone know why they didn't act upon it? The information given to Saoirse by Conor (there were no other responses to her queries at this time from either Conor or the rest of her siblings) of course did nothing to alleviate her concern for Dolores. Saoirse welcomed Conor's statement of the action he planned, but we are unaware if Conor contacted either his own solicitor or Jaggers and Brass. There is no evidence we've had sight of to think that he did. Conor did not respond to Saoirse's offer to aid him. 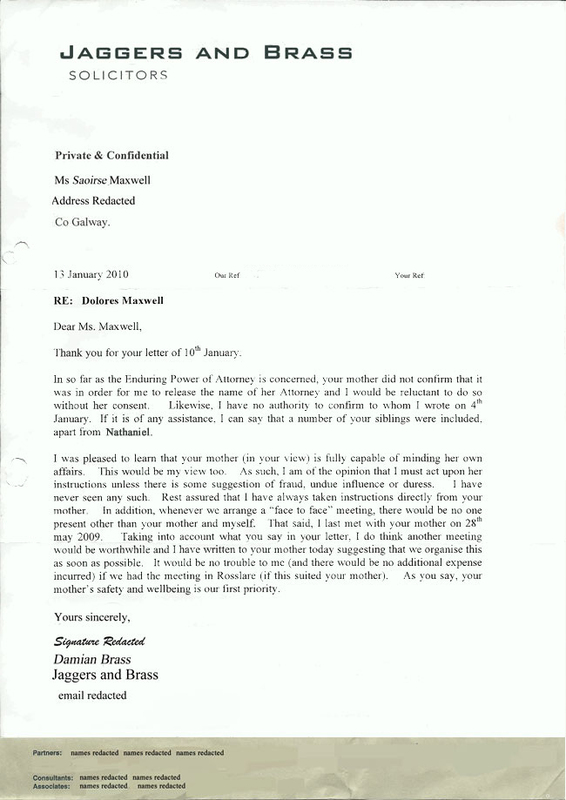 We are not sure of who Damian Brass sent the January 4 letter concerning Dolores' Enduring Power of Attorney. Nathaniel has stated that he did not receive it. Two of Dolores' other children stated they did not receive it. The rest said nothing. The only evidence we have been able to find would seem to indicate that Saoirse was the sole target of the January 4 letter. Dolores understood that this letter went out to all her children. As detailed in The Solicitor's Letter, there are many reasons why it appears that Dolores herself was uninvolved with the instructions to Damian Brass to issue it. Untrue. Saoirse's letter was of course not the first time Jaggers and Brass had received “some suggestion” of duress, undue influence and abuse. Saoirse's letter was the fourth “suggestion” “of such”; these came from four separate sources. We can only judge this to be untrue. Damian Brass himself admitted that he knew Dolores didn't type, and would “disregard” certain instructions received from “Dolores.” Damian Brass did act upon other instructions we deem to be obviously from Ethan. How did he decide which to act upon and which to disregard? We are actively seeking an answer to this very important question. This is when Dolores changed her will the first time. See the FAQ, Dolores' Will. Overwhelming evidence and documentation would suggest otherwise. Throughout this time, Saoirse continued her attempts to reach Dolores by phone. Saoirse last spoke to Dolores on Tuesday, January 5. [Editor's note: See the account of this call here. ] Saoirse's log is full of attempts met with Dolores' land line ringing out, and the mobile “unavailable”. Neither was set up to receive a message. The same thing was encountered with her many attempts to reach Ronan, who lived a short walk from Dolores. It was now approaching the two–year anniversary of Cecil Maxwell's death. It was strange that there was not a word from Dolores about a mass or other remembrance. mom is fine, has been up since 5am vomiting galore, bin by her bed, and looking forward to going up to Dublin. I just spoke with Geoffrey Blair with the HSE elder abuse. It appears mom sent a letter into the community services, welfare office (nothing to do with his department) supposedly sent by mom, signed by her it appears. The letter assures the recipient that mom has a power of attorney, that she doesn't want to see any of us visiting. Geoffrey is not comfortable with it and doesn't understand the power of attorney mentioned as that has nothing to do with the fact we couldn't visit mom at Christmas or can't reach her etc. After trying to reach mom and Ronan several times yesterday, and texting many of you, I received a text from Sophie this morning saying mom was fine. (Did receive yours too Nathaniel) Sophie says mom was up since 5 am vomiting galore but ‘was looking forward to going up to Dublin.’ Why, I'm not sure and how I'm not sure? I sure hope it's not via the train or bus, if she's sick like that. Not being able to reach her on dad's anniversary has me worried too but I know it's just another Ethan preventing that. Her home line is busy and no answer or response to her MOB from me. I believe Ethan is down there or enroute or she is heading up and he's ensuring we can't reach her today on dad's anniversary. Will see if I can reach Ronan. Didn't receive a response from my text to him either and his MOB is engaged. I don't believe a word of that about not wanting any of us to visit. Certainly has never ever said not to. Is there sense in asking her about this on her own? As in showing her the letter and asking did she send it. I don't believe she did. Could also ask her solicitor is he aware of it. Spoke to her, too sick to go to Dublin. Her mobile kept ringing so may be on that. Is there any way we can meet HSE some time? My instinct is that we let the solicitor know our concerns in writing to force his hand. We will need to spell out that to minimise stress on Dolors [Dolores] we will comply with this requirement not to visit her. But I think we need to point out that it is a very strange situation that when the rest of her family want to call or visit it is prevented from happening. Dolors is not doing this, Ethan has to be behind it, Dolors is too old to fight anymore and this is showing very clearly. We should tell him that we have been in contact wiht HSE etc becuase of our concerns for her welfare and that the power of attorney completely misses the point. But the fact that it has been raised does make me very nervous that Dolors is being prayed upon. Ethan would not even drive her to mass he was trying to control her so much. My feeling is she is being isolated by him. If there is a problem on financial side then as her lawyer he must advise her accordingly but remind him that because of the situation he must expect that this will be looked at later. Particularly if something happens to her. My biggest fear is that if she needs nursing care and has passed money to him then she will not be able to afford this. Dont forget he has just moved to a new house in Bray. I just don't understand Sophie on this. [Editor's note: Misspellings from the original. We are compelled to comment on a couple of things in Conor's correspondence here. This email was sent to Saoirse and her brothers. We note that he begins with “Lads,” – we state again that women are routinely discounted in Ireland, and certainly by the males of this branch of the Maxwell family. This includes not only Saoirse; it also touches her sisters and Dolores. The pervasive misogyny in Irish culture has been touched on before in these pages, and we see Conor's greeting as an example of this systemic and automatic attitude. By this time (January 22) some of her siblings had provided Saoirse with some information she had been unaware of concerning Ethan's behaviour, and Sophie had made an unsuccessful attempt to lessen Ethan's control of Dolores and allow others access to her; that was the extent of any aid offered to either Dolores or Saoirse. Lads, indeed. In this editor's view, the majority of so–called “men” in Ireland are in fact women. “…we have been in contact wiht HSE etc becuase of our concerns for her welfare…” Not true. Despite the contining pleading by Saoirse, the first of the lads contacted Geoffrey Blair two and a half months later, asking him what else Saoirse could do. As for the lad Conor, nearly six months passed from Saoirse's plea to him in December before he contacted Geoffrey Blair. Lads, indeed. Is there a definitive reply from each of you - did you receive the solicitor's letter. Sean I know you didn't. The lawyer is already aware of gardai etc. see attached letter from me to him in response to the registered letter. I've since received a response to that letter. Not yet scanned in. Will do so and forward to you. I plan to respond to that one today. I firmly believe we should be visiting and keeping in contact with mom. I also believe anyone who got Mr Brass' letter should respond to him with your concerns. I think each of you should also be in contact with the HSE - Geoffrey Blair. I've already asked you all several times but not received a confirmation or response. Ethan can't deal with us keeping the pressure or focus on. He can't stand that I keep digging and plodding forward. That's what we need to do. Keep plodding. My case by itself isn't yet strong enough. But were we to provide each of our versions I believe it would. Unable to get mom via mob or landland. Sophie says she's no problem but I believe it's a text sent to me after consulting with Ethan. I eventually got Ronan. Not much going on there but says Mom is not heading to Dublin. Sophie, like Ethan (sorry) is motivated by money. Plain and simple. I'm sure she and Ethan have worked out a deal of sorts. I plan to set up a meeting with HSE's Geoffrey Blair and am hoping I can arrange for the solicitor to be there. Am hoping perhaps you and me, Nathaniel, could meet with them and Mom and speak one on one. What facts are in hand speak for themselves and any attempts at sidetracking etc. would be instantly addressed. At the moment, not one of us can get a one-on-one private moment. I do believe were mom to speak one on one, and in a non-threatening/non-confrontative environment she would open up. Ethan can't afford for me to meet with mom one-on-one because he knows I'll get the answer he fears I'll get and he know's I'm working to stop it. I've not been scared off, bullied off or threatened off. I just want to see and visit with mom. Thinking of you all today and hoping things are going okay. Many thanks for the time on the phone. I will continue to strive and try and set up a meeting between yourself, Nathaniel and me to see if we can't talk to mom alone. In the meantime, here's a copy of the solicitor's letter and my response to him. I'll have my husband scan the response I received back from him and once I've composed a response to that will also forward you a copy. Is there any way you can please send me a copy of the letter sent to Community Services, supposedly by my mother? I believe she was bullied into signing it and that Ethan composed it. Thanks so much again. I'm just hoping I can save her in time and that her other children can get to see her. This correspondence between Saoirse and her siblings, and between Saoirse and Geoffrey Blair took place January 22, 2010. The next day Saoirse once again tried to arouse interest from the Gardai in Bray. She was informed that they had no interest, would not pursue it, there was nothing they could do and do not bother to send in any evidence or documentation, they wouldn't entertain it. It would not be the last time the Gardai refused to address the crimes committed by Ethan towards Dolores and other parties. This clearly violated their own official policies and protocols. There were eight months and three days remaining to save Dolores. [Editor's note: the next part of A Winter's Tale will focus on more correspondence from Dolores' solicitor, Damian Brass, among other items. It is called Brass Signs Off.